There are viruses, bacteria and parasites that can potentially infect chickens, but the industry has many strategies in place to reduce the incidence of illness in chicken flocks, to the point where outbreaks of disease are not common. The emphasis in flock health programs is on prevention rather than treatment, which is why vaccination, farm hygiene and biosecurity are the most important strategies employed to keep Australian chicken flocks healthy. In some circumstances, where other disease prevention and management strategies aren’t successful, a bacterial or parasitic disease may occur that requires a veterinarian to authorise flocks to be treated with an approved antibiotic or other antimicrobial. Farmers and chicken companies accept that they have an obligation to ensure the chickens in their care are free from disease and as healthy as possible. To not treat sick birds would compromise their welfare, and potentially allow them to suffer. Disease prevention and control is likewise a key responsibility to the chickens in their care. In order to manage disease, poultry veterinarians need to have access to appropriate tools. These tools include preventative measures, such as farm hygiene and vaccines, where they are available, but can include antibiotic / antimicrobial treatment where there is no other viable or effective solution. In such circumstances, only medicines assessed and approved by the national regulator of veterinary products (the APVMA) are used. Most people accept that if animals, including chickens, need to be treated to ensure their health and welfare, then they should be treated. However, there are several reasonable concerns shared by both the community and the chicken industry with respect to the use of antibiotics in food producing animals which the industry is keenly aware of and careful to address in its practices. The two primary and very different concerns are, firstly, the possibility for residues in meat and, secondly, the potential for use in animals to contribute to resistance in antibiotics that are important in treating diseases or infections in humans. What are antibiotic residues and what does the chicken industry do to prevent them? An antibiotic residue is a small amount of antibiotic that remains in the edible tissues of a treated animal after the main part has gone or been used or excreted. Residues are managed by the use of withholding periods, to ensure that antibiotics have been sufficiently degraded and/or metabolised by the animal before they are slaughtered for human consumption. Several antibiotics used in poultry are not absorbed from the gut and do not leave residues and no withholding period is necessary. The practice of enforcing appropriate withholding periods ensures there are no unsafe residues in meat or other products destined for sale for human consumption. Consumers can therefore be confident that they are not being exposed to risks from antibiotic residues when eating Australian chicken meat. What’s antimicrobial resistance and how does the chicken industry help prevent it? Antimicrobials are a broader class of medicines that includes antibiotics. Antimicrobial refers to any type of product or compound that is active against (ie kills or inhibits the growth of) a variety of microorganisms, which could include bacteria, fungi and parasites. Antibiotics are a sub-set of antimicrobials, in that they are specifically active against bacteria that cause disease in humans or animals. Some microorganisms (including bacteria) are naturally resistant to certain antimicrobial medicines. However, some microorganisms which were originally susceptible to an antimicrobial medicine, such as an antibiotic, can acquire resistance to the medicine through exposure to it. Once this happens, this particular antimicrobial medicine may be ineffective in treating an infection caused by that microorganism. The chicken industry takes antimicrobial resistance very seriously. In collaboration with the Australian Government’s Department of Agriculture and Water Resources’ Animal Biosecurity and Response Reform Program, the industry participated in a national survey of antimicrobial resistance in Australian meat chickens. The survey represents the most comprehensive data set to date on the level of antimicrobial resistance (AMR) found in bacteria in Australian meat chicken flocks. The results show the Australian chicken meat industry is in an enviable position globally with low and improved levels of AMR and, importantly, low levels of resistance to antimicrobials that are priorities for use in human health. This has been achieved due to the industry’s long-standing program of responsible use of antibiotics. 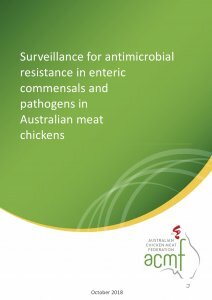 Please click here and to the right to view the ‘Surveillance for antimicrobial resistance in enteric commensals and pathogens in Australian meat chickens, 2018′ report. Please note there are scientific publications in preparation, yet to be published, which will provide more detail on the results. The chicken industry also takes its role in preventing antimicrobial resistance development very seriously. For historical antimicrobial stewardship efforts made by the industry and major breakthroughs that have allowed the industry to reduce, refine and replace its antibiotic use, see here and below. 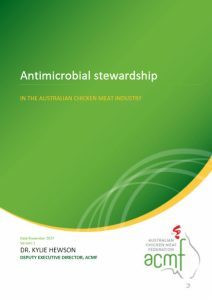 The ACMF has also contributed to a report that provides an overview of historical and current practices relevant to antimicrobial stewardship in Australian livestock industries. This report was funded by the Australian Government Department of Agriculture and Water Resources and can be found on the Animal Health Australia website here. Australia has a long history of regulatory control over use of antibiotics and other medications in animals, including livestock. 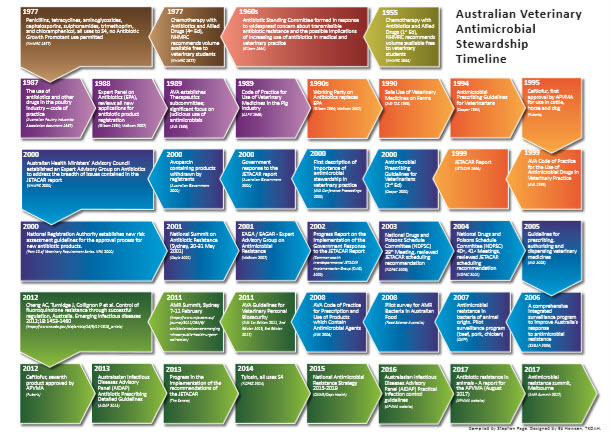 A diagrammatic timeline of significant developments in the control of use and stewardship of antibiotics in Australia’s animal industries can be found here and above. The chicken meat industry agreed back in 2007 that if antibiotics were to be used at all, they must only be used for therapeutic purposes (to treat, control or prevent disease). They are not to be used for growth promotion. Furthermore, no antibiotics that have been determined by the World Health Organisation to be critically important in human medicine are used routinely in chicken production. In addition, most antibiotics classified as the highest priority for human health aren’t registered for use in poultry in Australia and are therefore not used at all. The major chicken meat companies in Australia have put in place antibiotic stewardship programs to ensure antibiotics are only ever used judiciously and responsibly. The aim of these programs is to minimise animal disease and suffering while also ensuring judicious use of antimicrobials that minimises antimicrobial resistance development, thereby preserving their effectiveness for humans and animals alike. 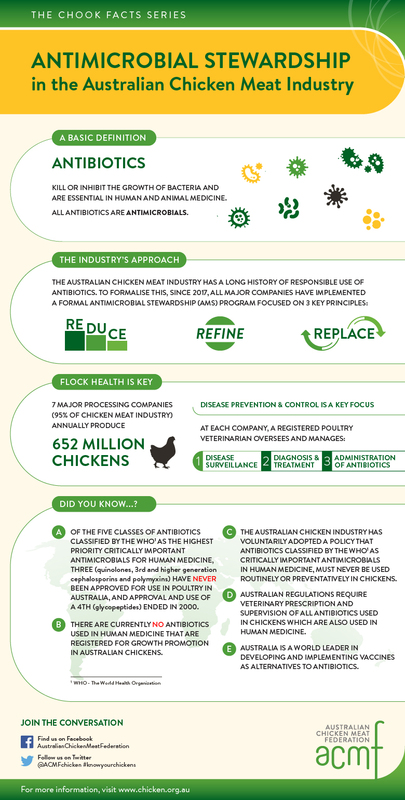 An infographic summarising the Australian chicken industry’s position and actions on antimicrobial stewardship can be downloaded on the left. For more information on the ACMF’s position and policies on antibiotic use, click here. Vaccination is a key tool farmers use to prevent diseases in chicken flocks. Australia has been at the forefront internationally in the development of new vaccines to prevent both bacterial, viral and parasitic diseases. For example, two vaccines now used internationally to protect poultry flocks against disease caused by the Mycoplasma gallisepticum and Mycoplasma synoviae bacteriums were developed here in Australia and the Australian poultry industry was the first to adopt them. Their use has meant that these diseases are rarely seen today, and because Mycoplasma gallisepticum infection is an important cause of a complex disease called chronic respiratory disease, this disease is also rarely seen. Why this is particularly significant is that chronic respiratory disease was once (until the late 1990s), the major reason that flocks needed to be treated with antibiotics. With this disease effectively managed by vaccination, the need to actually treat chicken flocks with antibiotics immediately and dramatically declined. Chicks are generally vaccinated for infectious bronchitis and Marek’s disease in the hatchery before they are placed on farm. Depending on which state the flock is located, they may also be required to be vaccinated against Newcastle disease. Chicken breeder flocks need to be vaccinated against a broader range of diseases, than the meat chickens that are reared for human consumption, because they ultimately live longer and therefore have a higher chance of contracting something that can make them sick. They will be vaccinated against a range of diseases during their lifetime, including those mentioned above for meat chickens, however the actual diseases vaccinated against, vaccines used and program and timing of vaccinations will vary for each company and according to the disease risks in the region. Breeder flocks are vaccinated, not only to protect their own health and productivity, but in many cases to provide protection for their progeny chicks through antibodies passed on in the yolk sac of the fertile eggs they produce. These are called ‘maternal antibodies’ and the immunity conferred to their progeny chicks is called ‘maternal immunity’. Maternal immunity is particularly important in the case of a disease called infectious bursal disease, for which protection of chicken flocks is largely dependent on maternal antibodies. Breeder flocks are sometimes also vaccinated against bacteria that don’t actually make the birds themselves sick, but which can be the cause of food borne illness, thereby reducing the risks of these bacteria entering the food chain. Blood tests are used to monitor the effectiveness of vaccination. Some companies have their own laboratories at which these tests are conducted, while others use university, government or private diagnostic laboratories. Coccidiosis is a significant and common disease of all poultry all over the world. It is caused by a parasite which infects the gut of the chicken causing diarrhoea, damage to the gut and significant production losses and mortalities. It is treated by the use of medicines called coccidiostats. As coccidiosis is extremely common in all poultry raised on the ground, coccidiostats are routinely included in chicken feed. Necrotic enteritis is caused by the overgrowth of a bacteria called Clostridium perfringens in the gut of chickens. When this overgrowth is triggered, a high proportion of the flock can die. This condition is controlled by a combination of dietary management and the preventative and targeted use in at risk flocks of medicines of limited importance in human medicine, which are delivered in the feed. Information on the range of diseases to which poultry are susceptible can be found on the PoultryHub website: http://www.poultryhub.org/health/disease/. Some conditions to which chickens are susceptible are not infectious but can nevertheless affect their health and wellbeing. These can be caused by intoxications, such as through the consumption of small quantities of fungal toxins brought into the feed through grains, or be metabolic in origin. Intoxications are managed by the industry through the careful screening and sometimes treatment of raw ingredients and through careful feed formulation practices. Fortunately, the incidence of metabolic conditions, such as skeletal deformities and heart attacks, has declined to very low levels in recent years, largely due to genetic selection for better leg health and cardiovascular and skeletal robustness. Furthermore, research into the environmental and nutritional factors that predispose to these conditions has led to the development and adoption of better nutritional and husbandry practices designed to prevent the emergence of such conditions. There are a number of serious poultry diseases which occur elsewhere in the world but from which Australian poultry flocks are free. Australia’s geographically isolation from the rest of the world and strict quarantine arrangements have assisted in keeping these diseases out of our flocks. It is because of our favourable flock health status that there are strict controls on the importation of chicken meat into Australia. For more information on the controls that are in place on importation of chicken meat the impact of these on where your chicken has been produced, see here. Avian influenza is a high profile emergency poultry disease, and for good reason. Avian influenza is a disease of birds which is caused by a virus that can infect many types of birds, particularly ducks, chickens and turkeys, as well as pet birds and wild birds. It is commonly referred to as ‘bird flu’ and, although rare, some strains can cause disease in humans that have had close contact with infected birds. Wild water fowl are known to be carriers of the virus and are a important source of spread. For comprehensive information on avian influenza, visit the Australian Government’s Department of Agriculture and Water Resources avian influenza page. Australia has had seven outbreaks of highly pathogenic avian influenza in commercial poultry flocks over the past 50 years, the most recent of which occurred in 2013. On each occasion the outbreak was rapidly brought under control and eradicated, thanks to Australia’s emergency animal disease response protocols and other preparedness arrangements. Importantly, most of these outbreaks have occurred in other sectors of the poultry industry. There has not been an avian influenza outbreak involving a meat chicken flock in Australia since 1985. Because wild birds can carry avian influenza viruses and therefore have the potential to be a source of infection for the commercial poultry sector, there is a wild bird surveillance program for avian influenza managed through Wildlife Health Australia. This program keeps track of what types of avian influenza viruses are circulating in Australia’s wild birds. For further information on this program, see here. Chicken meat is safe to eat if it is cooked properly. Avian influenza does not survive cooking temperatures. Furthermore, Australia’s emergency disease response protocols ensure that if there is an avian influenza outbreak in Australian commercial chicken flocks, that the risk of infected chicken meat entering the market is negligible. While Australian poultry flocks are free of many diseases that plague the industries in many other countries, we are not entirely immune from them, as many of these diseases can be carried by wild birds. Therefore, the chicken meat industry, together with a range of other Australian livestock industries, has entered into a collaborative agreement with State and Australian Governments covering how certain emergency animal diseases will be responded to and how the cost of the response will be shared by the parties. This agreement is called the Emergency Animal Disease Response Agreement . This agreement is unique internationally and ensures that any emergency animal disease, including avian influenza, is quickly controlled and eradicated. The strategies that will be adopted to respond to and bring under control these emergency diseases are called AUSVETPLANs. The AUSVETPLAN for these emergency poultry diseases – avian influenza, Newcastle disease and Infectious Bursal Disease (caused by very virulent IBD virus or exotic antigenic variant strains of IBD virus) – are available from Animal Health Australia. These disease strategies have been collaboratively developed by industry and all levels of Government across Australia. Industry funding for Animal Health Australia and for industry’s share of costs incurred in responding to an emergency poultry disease is collected through a levy on all one-day-old chicks, collected by hatcheries. Biosecurity refers to those measures taken to prevent or control the introduction and spread of infectious agents. Such infectious agents, whether they cause clinical or subclinical disease, can reduce the productivity, profitability and long term financial viability of a poultry operation. Some infectious agents may also pose risks to human health. To prevent the introduction of infectious disease agents to chicken farms. To prevent the spread of disease agents from an infected farm to other farms, or from and infected area to an uninfected area. To minimise the incidence and spread of microorganisms of public health significance, including foodborne pathogens such as Salmonella. High standards of farm hygiene and biosecurity practice are implemented on all meat chicken and meat breeder farms and hatcheries to reduce the risk of disease moving on to farms from outside sources, moving between sheds on the same farm, moving between farms, being carried over between batches in a shed, or being passed from parent flocks to their progeny via the egg. Good hygiene in the hatchery helps to reduce the chances of infections being picked up by chicks while they are in the hatchery and then transferring these onto farm. At the farm level, chicken farmers take a range of precautions to prevent entry of diseases onto their farms. As rodents and other animals can carry and transmit disease agents, pest control programs are implemented to reduce the risk of diseases being carried on to the farm by rodents and other pests. Measures are also taken at the feed mill to reduce the risk of any disease agents and other pathogens from getting into chicken feed from feed ingredients or from contamination of the finished feed. Biosecurity is an essential element of good animal husbandry. To learn more about biosecurity practices in the Australian chicken meat industry, click here to view a short video. 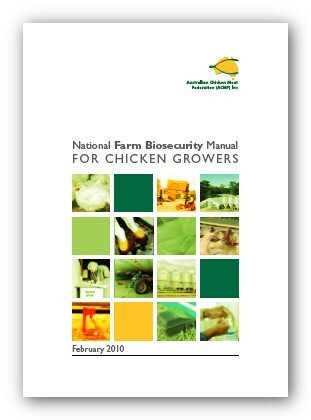 Since 2002, the chicken meat industry has had a national biosecurity manual for chicken farmers. Chicken processing companies often require compliance with this biosecurity manual as a condition under their contractual arrangements with contract chicken growers who rear their chickens. Companies may have additional biosecurity requirements for their own farms or for farmers supplying to them, to address the biosecurity risks that are specific to their circumstances. 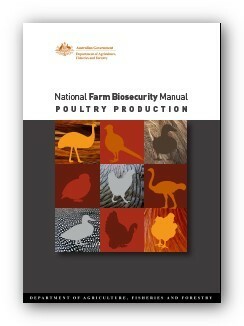 The current version of the National Biosecurity Manual for Chicken Growers (February 2010) is currently under review. A revised version of the Biosecurity Manual is due for release later in 2018. 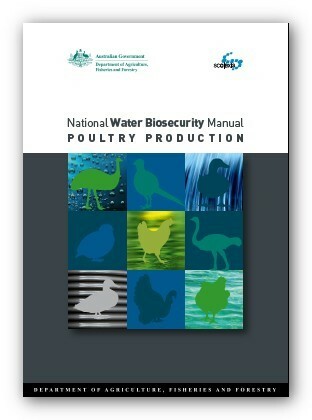 The current National Farm Biosecurity Manual for Chicken Growers is available by clicking here or on the picture on the left. This is the manual that all chicken growers should have on hand and adopt, as it is specifically targeted at the meat chicken sector of the poultry industry. A range of convenient templates can be downloaded separately from this page. For the poultry industries more generally, there is also a National Farm Biosecurity Manual for the Poultry Industry, which is applicable, not only to meat chicken farmers, but also to egg, duck, turkey, game bird, emu and ostrich producers. This manual is published by the Department of Agriculture and Water Resources and can be downloaded as a PDF by clicking here or on the picture on the left. Water used for drinking, cleaning and cooling has been identified as of prime importance to maintaining good biosecurity. Therefore, the Department of Agriculture and Water Resources commissioned and published a report that reviewed water biosecurity and which provides guidelines for implementing good water biosecurity systems. This report is available by clicking here or on the picture on the left. The welfare of chickens in their care is of critical importance to both chicken farmers and chicken processing companies. This is out of respect for the chickens themselves and out of respect for community expectations for the humane treatment of animals. Good welfare means more than simply ensuring flocks are kept healthy. Chickens need to be maintained in an environment where they are comfortable, protected from injury, pain and predation, fed optimally and able to express important social and other behaviours appropriate to their age. It is also important that they are cared for by experienced stockperson who understand their needs and behaviours. The viability of the industry depends on good welfare outcomes being achieved. For example, it simply makes no economic sense to rear and feed a chicken to an advanced stage for it then to be lost to disease or injury. If a chicken is sick or injured to the extent that it is likely to suffer severe pain or distress and it cannot be treated, it must be culled quickly and humanely on farm so that it does not suffer. Only chickens reaching the processing plant live and uninjured can be processed. All companies and chicken farmers incorporate elements of good practice for bird welfare in their standard procedures. Standards adopted ensure that chickens are kept in comfortable conditions by managing factors such as temperature, humidity, airflow, air quality and litter conditions, and ensure they are provided with good quality water, shelter, and a high quality diet that meets their physiological needs. These factors have an important effect on the welfare of the chickens as well as on the overall efficiency of the farming operation. Meat chickens are never raised in cages. Commercial meat chickens are raised on the floor in large, temperature regulated barns. Free range chickens also have access to an outside area or range, as well as their barn, from an age at which that they are sufficiently feathered to withstand outdoors temperatures. Most free range farms adopt the standards of and are accredited by the Free Range Egg and Poultry Australia (FREPA). For more information on this program click here. All chickens are stunned and rendered insensible to pain prior to slaughter. The minimum standards for the housing, management and transportation of meat chickens and breeders are laid down in Government and industry-endorsed voluntary Codes of Practice and regulatory standards designed to safeguard their welfare. 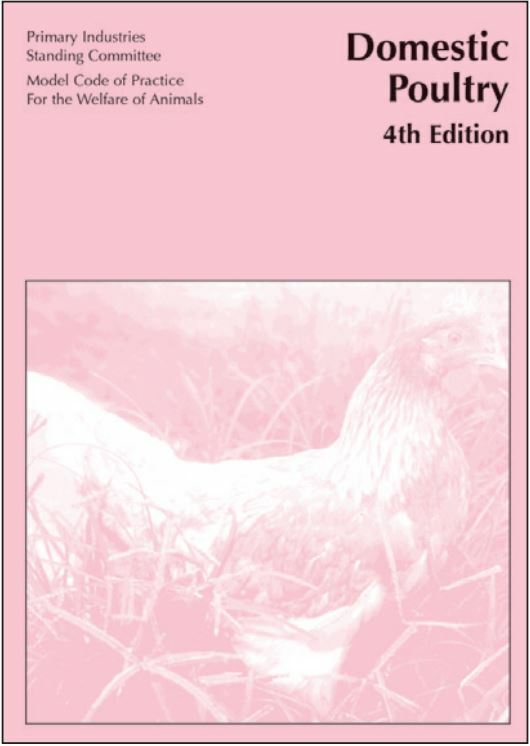 A copy of the Model Code of Practice for the Welfare of Animals – Domestic Poultry can be downloaded by clicking here. The provisions in this Code cover meat chickens and breeding birds on farm and chicks in hatcheries. All States and Territories of Australia currently have laws to protect the welfare of animals and these laws take into account, in various ways, significant practices and desired welfare outcomes identified in the Code of Practice. At the moment, Australia is in the process of revising this Code of Practice and replacing it with standards and guidelines. These standards and guidelines will also cover welfare of chickens at the processing plant and up to the point of slaughter. It is intended that these standards, once finalised, will be embedded in law across Australia, whereas the guidelines will remain recommendations for best practice. For an update on progress, see the Animal Health Australia (AHA) website. AHA was contracted by Australian governments to manage this project. The welfare of chickens during transportation, including from the point that flocks are prepared for collection to go to the processing plant to the time of their arrival at the plant, are covered in national standards and guidelines which are adopted in State and Territory laws. 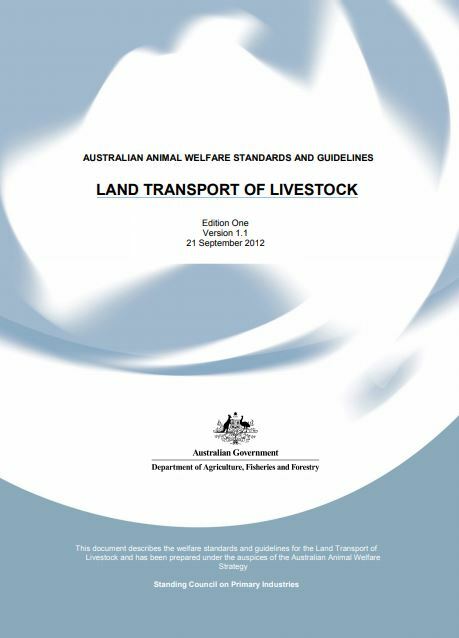 These Land Transport Standards, which also apply to other species of Livestock, can be found here. The industry has developed a model welfare audit program which covers hatchery, breeder rearing, breeder laying, grower, and the pick-up, transport and processing sectors. Details and standards can be found under Industry Resources. Several Chicken companies have incorporated elements of this welfare audit in their own quality assurance programs. All companies incorporate elements of good practice for bird welfare in their grower manuals and many of their major commercial customers have audit programs that specifically include aspects of good bird welfare. Most free range farms adopt the standards of and are accredited by the Free Range Egg and Poultry Australia (FREPA). For more information on this program click here. The majority of meat chickens in Australia are also grown and accredited to the standards of the RSPCA Approved Farming Scheme. For more information on this program and the standards that apply to it click here. For more information on the above two programs and the extent of participation in them, see here. For a comparison of the standards that apply in different production systems and programs click here. Not only is welfare a focus of how chickens are housed, managed and cared for on farms across Australia, but it is also being addressed at a genetic level, through international chicken breeding programs. While early meat chicken breeding programs focussed predominantly on increased growth rate and increased meat production, over the past 40 years that approach has given way to a much more balanced breeding program with a clear focus on improving animal welfare, reproduction and fitness outcomes (see more here). Decades of breeding for health and welfare traits in modern meat chickens have delivered results. The meat chickens of today are more robust, have stronger legs and more robust cardiovascular systems than the chickens we used only a few decades ago. That has all been achieved by conventional selective breeding programs and been possible because breeding companies have focussed their breeding programs on these attributes over the past 40 years. This graph below shows what has been achieved over the last two decades in particular. Source: Avendaño, S., Neeteson, A. and Fancher, B. (2017). Broiler Breeding for Sustainability and Welfare – are there Trade Offs? In: Proceedings Poultry Beyond 2023 Conference, New Zealand, 2017. What this graph shows is that it has been possible, through balanced breeding programs, to simultaneously improve attributes which are slightly negatively correlated (such as bird weights and leg strength) to deliver a modern chicken strain that not only grows better but also has improved leg and heart health than the chickens we farmed 20 years ago. The above data comes from the breeding program of one of the two major breeds of meat chickens used in Australia today. Each coloured line in each of the above graphs maps the relationship between bird weight and each of four different traits for individual birds in the nucleus breeding population within a given year. 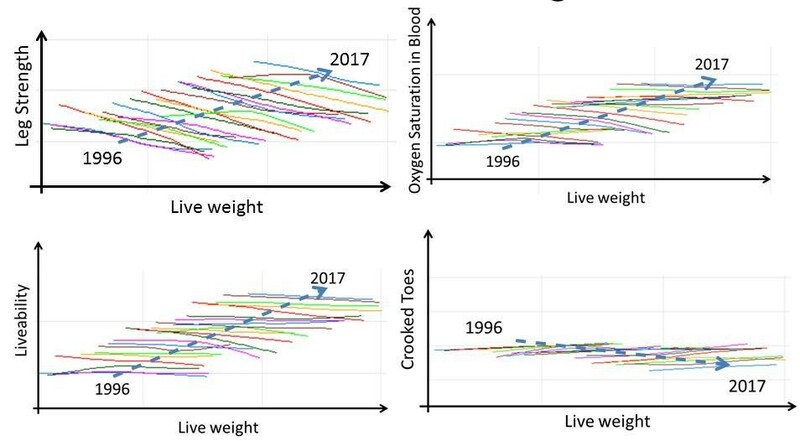 So, looking at the top left graph for example, you can see that, within the population in any particular year, there is a negative relationship between bird body weight and leg strength, because the line within a year trends downwards with increasing bird weight. However, there is sufficient variation within the breeding population for both these traits that it has been possible to select for both traits simultaneously, such that each subsequent year the next generation of birds has improved in both weight and leg strength than the generation before. 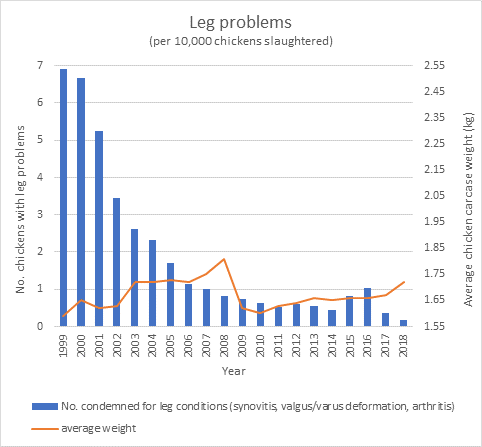 After 20 years of breeding in this way, not only have bird weights increased (moved to the right in the graph), but overall leg strength has improved, and the chickens with worst leg strength today are actually better than the best chickens in the population for leg strength 20 years ago. These graphs show that not only has leg strength improved over the past two decades, but so has cardiovascular function and liveability, while the incidence of crooked toes in the population has decreased. Has this Translated to Improvements in the Field? The best (independent) evidence that the above improvements in chicken breeding populations have actually translated into better welfare in the field comes from Canada, where the same meat chicken strains are used as are used here in Australia. For the past 20 years, Agriculture and Agri-Food Canada has been collecting and publicly reporting data from federally inspected chicken slaughter plants, on the number of chicken carcasses downgraded (“condemned”) for various reasons. This is perhaps the most complete, longer term database available globally which includes information on the incidence of several welfare-relevant indicators in chickens reaching the processing plant. 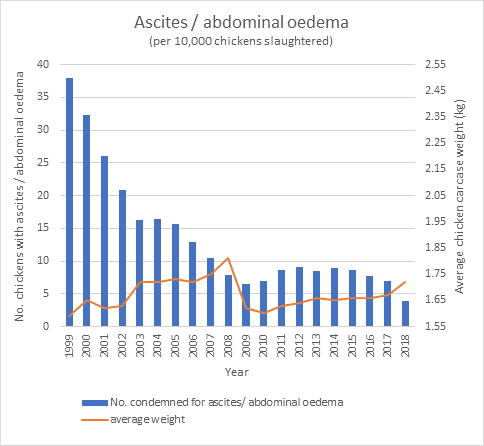 Indicators collected relevant to welfare include the number of chicken carcasses condemned for ‘leg problems’ and for ascites/abdominal oedema (a condition traditionally thought to be associated with the health and ‘robustness’ of the chicken’s cardiovascular system). The graphs below show the incidence of these two indicators from 1999 through to the most recent data (to January 2018). What these graphs clearly show is that the focus on health and welfare in international chicken breeding programs has resulted in dramatic improvements in key welfare criteria in chickens out in the field over the past 20 years, despite the fact that the average weight of chickens slaughtered has actually increased. These significant improvements have been achieved as a result of balanced breeding programs, incorporating health and welfare traits as well as bird performance traits, and no doubt helped by better on-farm management practices.